I have several copies of of place mats, again thanks to Roger. I worked to collect these copies so I could get the location listing. I found each issue of mats changed the list of stores and often had new "coming soon" listings, some of which never came. 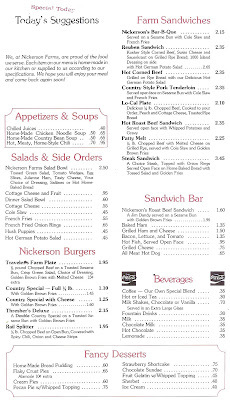 I am sorry the menu pages are so light and hard to read. Possibly you can blow them up to read them better. 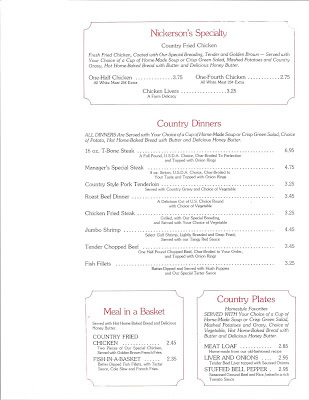 I am sure we all remember the Travelers Farm Plate or the Country Dinners, but there are several items I do not recall. If you have any menu or place mat items I would love to have a copy. 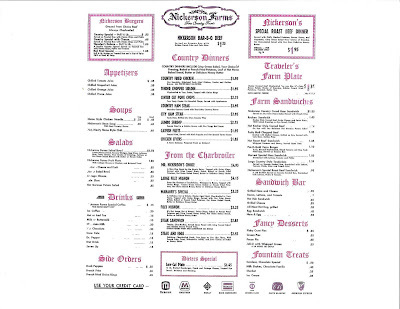 Wonderful memories of Nickerson Farms Fried Chicken and the hot bread and honey butter! 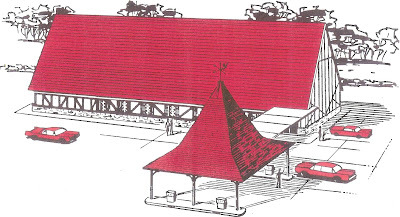 Wish these prices and Nickerson Farms still existed! I'll have the $3.25 filet mignon, please. Thanks for the memories of the days of travelling back in the 70s! 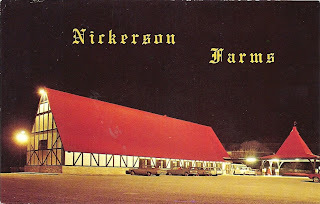 Back in the 70's, while driving from our home in western Iowa to visit his family in SE Kansas, seems like my dad would always take us to a Nickerson Farm in NW Missouri. He once quipped that us kids didn't HAVE to order grilled cheese sandwiches every time. Looking at the menu, I understand why he said that. But at the time, even as the oldest, I had no idea what most of the stuff on the menu was. And their grilled cheese was excellent! Thanks for the memories. I bought two books there that had poems and sayings from a person named Dan Valentines. I have never seen them anywhere else or have found this author. Does anyone know anything about him? I'll try and post the titles of them when i can dig them out. I LOVED Nickerson's Farms. Hated to see them go and I can always pick their building out as I travel and see what they have been converted into. Worked for the Nickersons in Eldon, MO, at their first store. Also at Max Allen’s Zoological Gardens, the business next door named for their son. Great fried chicken!